I found the endodontic course held at Harley street extremely professional and inspiring. The series of lectures given by Dr. Flynn were well presented, covering an array of endodontic topics in depth. Dr. Flynn, and his team, were keen to encourage all participants to become interested and motivated in order to maximise their full learning potential. I would highly recommend this course to anyone wishing to further their knowledge and understanding of endodontics in a friendly and welcoming environment. This was the first course I've done in over ten years, that delivered the sort of hands on experience and tutor feedback I've been looking for. This feedback showed me a few simple changes to make with my technique to stop losing working length. All the current and popular NiTi systems were available to use on the day. Each system was explained and critiqued. 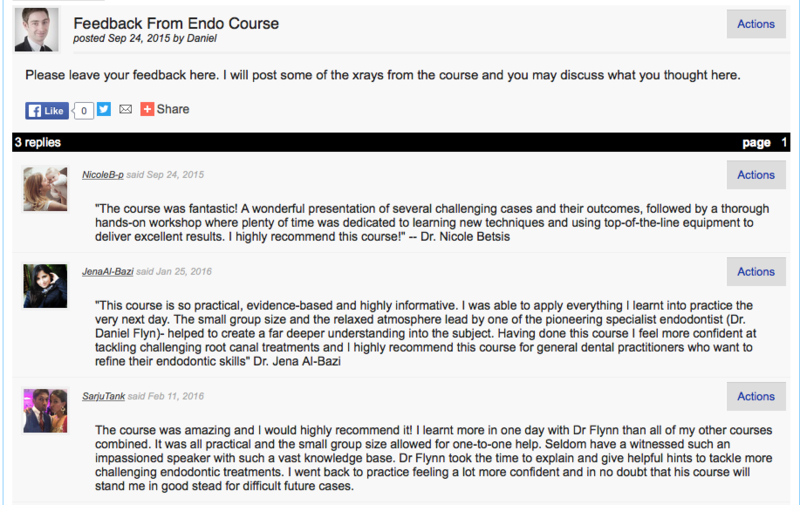 Since the course, Endodontics has become a little bit easier and a lot more enjoyable. This was by far the best endo course I have done. Daniel is an excellent tutor and manages the class and needs well. The facilities and microscopes are brilliant and I came away feeling much more confident. I had problem with loss of length lately. Having spent the day with you was educational. Have since been enthralled with beautiful root fillings. Have mostly had premolars to work on (think I needed to practice). I have used the original PA and an apex locator and the results have been just perfect. I am looking forward to a molar endo treatment. I loved the day as I felt it was addressing all my issues. Your approach shows that you have great experience and a good handle one the subject. Only a person who knows exactly what they are talking about can break a confusing subject down to very practical steps, an easy to understand. In summary, a great day with a brilliant teacher. Simple, practical, to the point teaching that is also very detailed. Wow, such a nice experiance i got on Saturday 26th of November, Dr. Flynn thank you for letting me update my knowlege, You were so patience with me, I strongly advise this course for everyone who wants to update and improve. I was not confident doing my endo treatment yet at the end of day i felt so strong and ready to overcome my worries. Thank you again for this beautiful effort. Dr. Flynn and your staff as well, other thing the lunch was outstanding really enjoyed it.